The lower trails are best for beginners, because they’re smooth and require little climbing. Experienced trail runners who are up for a challenge will find the terrain gets pleasingly technical, the higher they ascend. 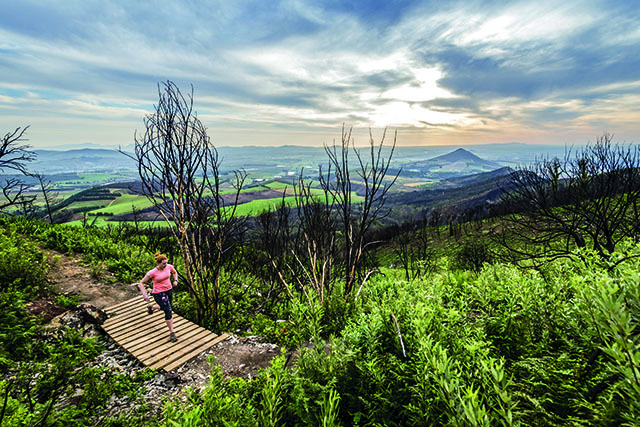 There are well-marked routes, ranging from 10km to 25km, making Simonsberg ideal for both mid-week and longer weekend runs. 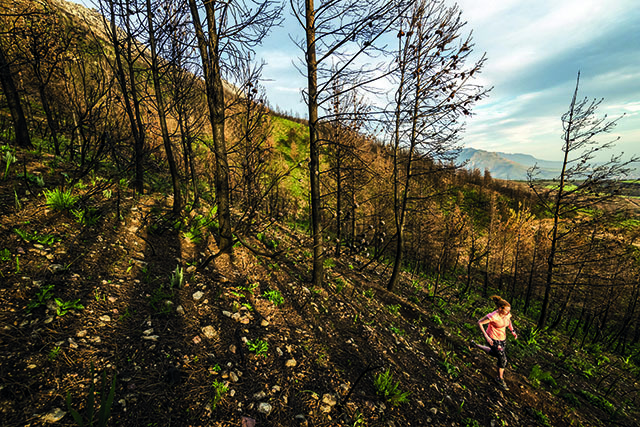 The trails are mostly smooth, well maintained and enjoyable to run on. Anything from 30 minutes to four hours, depending on which routes you choose and your training goals. There’s a useful map at the trailhead, which will assist you in planning your route. 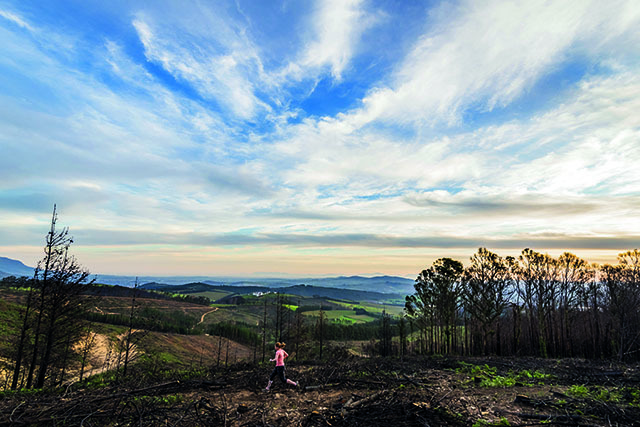 My personal favourite is late afternoon – especially if you plan to run on the trails above Delheim. The views of the sun as it sets over Table Mountain in the early evening are spectacular. The trails are also beautiful on an early summer morning, when they’re still in the cool shadows of the Simonsberg. The Farm Kitchen at Muratie Wine Estate (muratie.co.za), or the Garden Restaurant at Delheim Wine Estate (delheim.com). Order a Riverside Picnic from Delheim, and enjoy it under towering oaks. My personal favourite trail is called ‘Never say never again’, which travels high up the slopes of the Simonsberg. It’s 10km of sublime singletrack, and there are spectacular views over the Winelands, and across to Table Mountain. In spring, colourful wild flowers blossom – watsonias in bloom are truly a magnificent sight to behold. Reach the summit in time to watch the sun set behind Table Mountain – but do remember to carry a headlamp, for the long run back down. The Simonsberg Trails can be accessed via two trailheads – one at Muratie, and another at Delheim, off the R44. If you’re coming from Cape Town, the easiest way to get there is to take the N1, and then the R44 Stellenbosch turnoff. The Muratie/Delheim turnoff is to the left, before you reach Stellenbosch. Then it’s a 10-minute drive from the centre of Stellenbosch on the R44, towards the N1. Permits are available (R50 per day). If you plan on using the trails often, opt for an annual permit, which includes six bottles of wine from participating estates. Collect your permit from either Delheim or the Dirtopia Trail Centre, situated at Delvera. Be aware of hikers and mountain-bikers, who also use the trails.